Today I thought I would tell you about one of my favorite collections…going back many years. 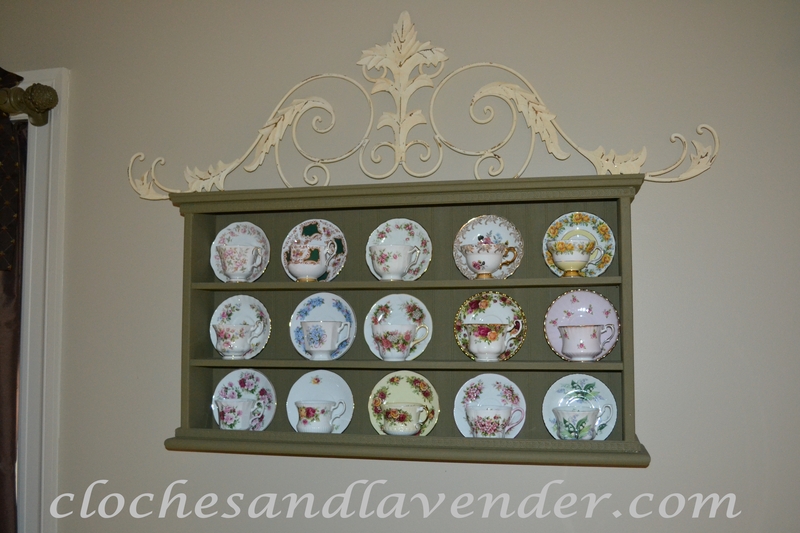 On our dining room wall, between the windows, I have a beautiful collection of teacups, many of which were my Grandmothers (some are from my Grandparents trip to Europe) and some were my Moms. They came to me when my Grandma and then my Mom passed away. I also received many as gifts. I love having something that was handed down through my family. We are kind of goofy during the holidays we usually pick the cup we want and use it to drink coffee or tea. The rack they are displayed on is about 20 years old. It has gone through a transformation; it used to be more of a country pine and had a plain wood finish. I did a paint treatment using a dark olive-green and removed the dowels that had crisscrossed it to modernize it a bit to match our decor. 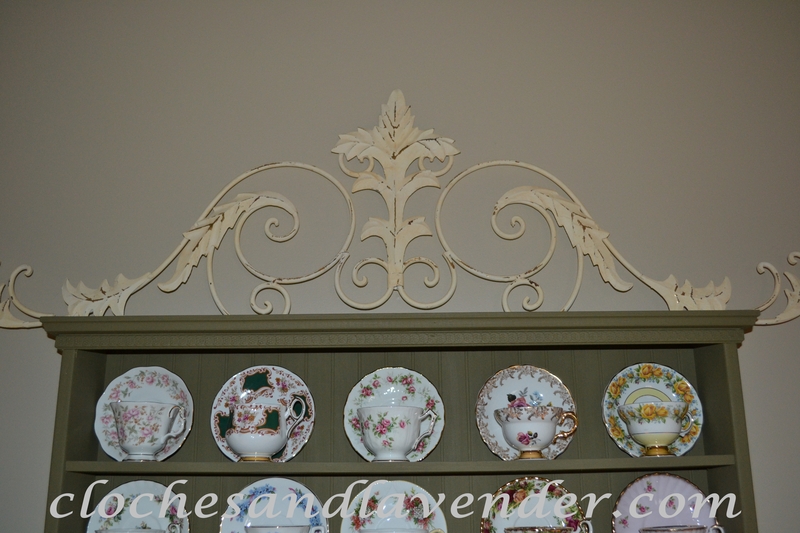 The metal scroll piece above adds a touch of European flair. You may notice the black table underneath; again that was originally plain oak with straight legs and no embellishments. 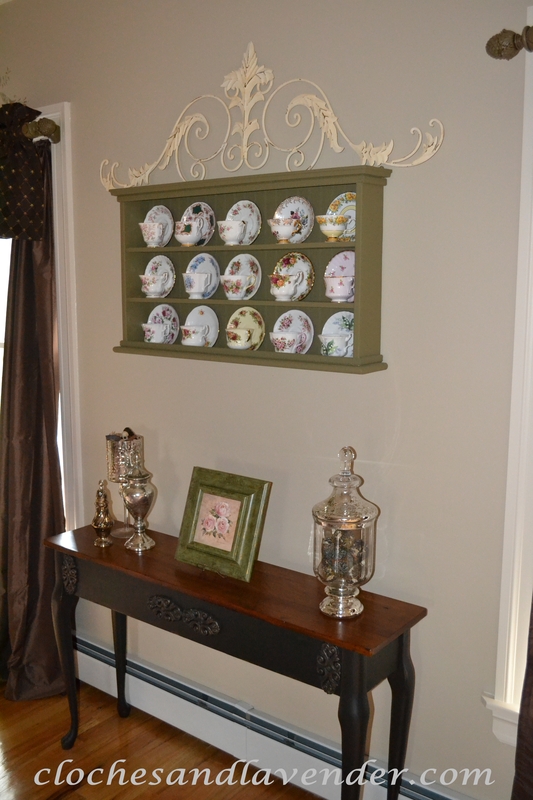 We changed the legs and added the appliques to add some formality, the top I left and stained it with Provence stain. I then painted the table black with an eggshell finish and I dry brushed the appliques with a metallic gold paint. We now have a nice grouping in the dining room that adds some charm and character to the window area. 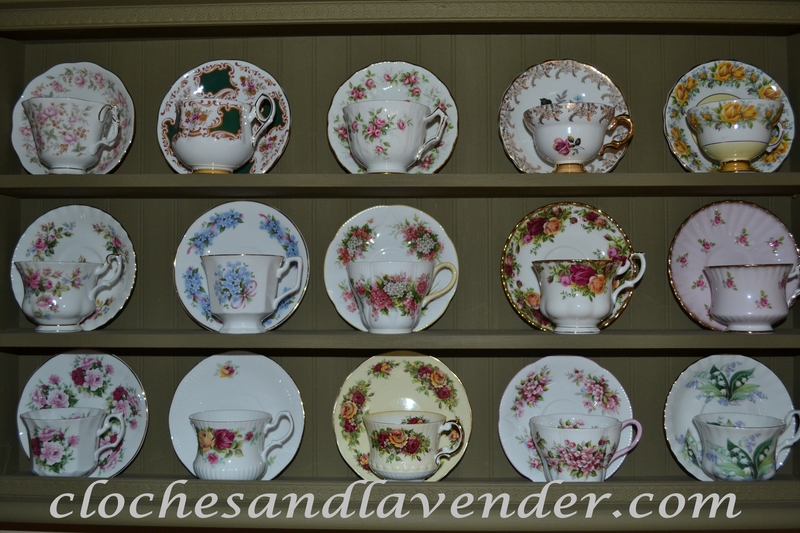 The teacup and saucer collection is lovely! I LOVE the idea of everyone choosing one and drinking out of at holiday get-togethers! Thank you very, it is a neat tradition. The table is very pretty. I like the subtilty of the appliques that you added. Your teacup collection is so pretty, Cynthia. They certainly must be a joy to look at and use. Thank you very much. They are a joy they remind me of my childhood. I hope you keep following me I am one of your newer followers. Had to come peek over at your collection! Love all the floral patters you have!!! So glad to visit…hope you have a fantastic week! Hope you come back and visit. Thank you for visiting me. That is a lovely collection, wonderfully displayed!